A 20 minute flight over Christchurch City the picturesque harbour of Lyttelton and stunning bays is the ultimate scenic tour in Christchurch giving you the best perspective of this beautiful part of New Zealand. Private charters available. 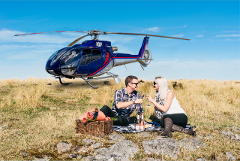 Enjoy the thrill of a helicopter flight to one of our regions finest wineries for lunch and arrive like a rock star! Be the envy of other guests as you arrive and depart in style by helicopter. 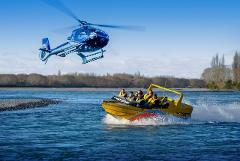 No trip to New Zealand should be made without experiencing one of the countries spectacular pristine rivers and a jet boat blast up the river is a "must do" activity. combined with a Helicopter flight it will be an extra special thrill! Fly to the magnificent Southern Alps for the best mountain experience in New Zealand, breathe in the fresh mountain air and capture the magnificent scenery. Optional lunch stop at a high country station. Akaroa is the jewel in Canterbury's crown, a gorgeous little French inspired sea-side village full of wonderful shops, restaurants and cafe's to explore and home to the world's rarest dolphin. A helicopter flight takes just 15 minutes! Want to propose or simply impress someone with a truly magical experience they will never forget? A helicopter flight from Christchurch to the city's highest peak offers inspirational scenery and awesome photo opportunities. A perfect way to spoil or surprise someone you love. Start with a scenic heli flight over Christchurch city and end at one of the city's best resorts for the night. This is an amazingly affordable package deal sure to impress! No trip to New Zealand should be made without experiencing one of the countries spectacular pristine rivers and a jet boat blast up the river, its a "must do" activity. Combined with a Helicopter flight it will be an extra special thrill! Cruise into Akaroa to be whisked away on a winery tour of North Canterbury. 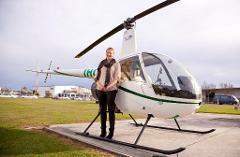 Take in views of Akaroa Harbour and Christchurch as you relax in your luxury helicopter. New Zealand alcohol laws apply. Fly from Akaroa through the mighty Southern Alps to view Aoraki Mount Cook, New Zealand's highest mountain. Take in the splendour of the Tasman Glacier, by landing on it by ski plane. Experience a breathtaking flight across the Canterbury Plains to the base of the Southern Alps, for the award winning Middle Rock High Country Farm Tour and Kiwi lunch, with optional jet boat ride and morning tea. Fly across the fantastic Canterbury Plains to the world famous Hanmer thermal hot springs at the base of the Southern Alps. Experience their Signature Body Cocoon Spa experience, with optional horse drawn carriage ride through town.